I enjoyed the trip and experience as much as everyone else since I also learned and improved through the tour. Given the positive feedback and encouragement I decide to continue offering such Wellness tour as long as my time permits. 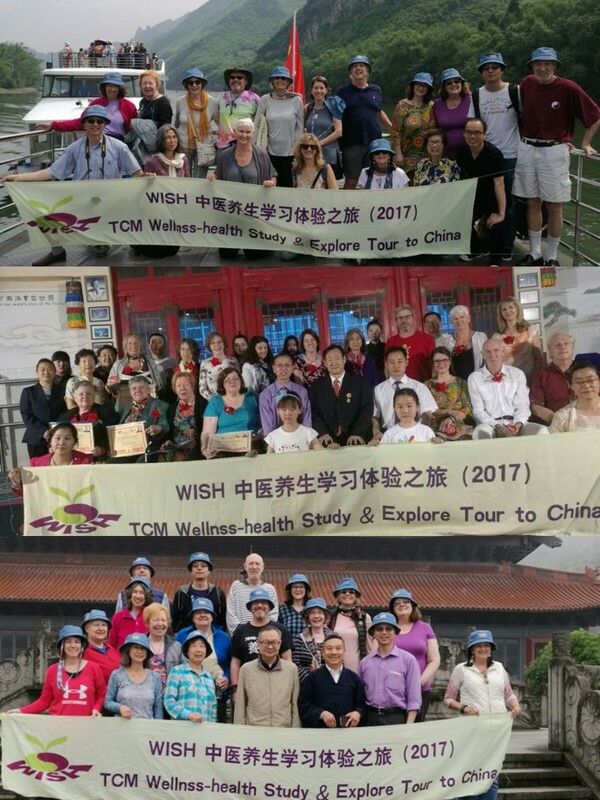 Our next TCM Wellness Tour to China will take place in October 18-31, and the itinerary will be slightly different from the last one since I am going to co-host the 2017 Guolin Xin Qigong Wuyishan English Camp from October 8 to 19, and our Wellness tour will start at the Mount Wuyi, the world culture and natural dual heritage, and a national 5A-class tourist attraction. 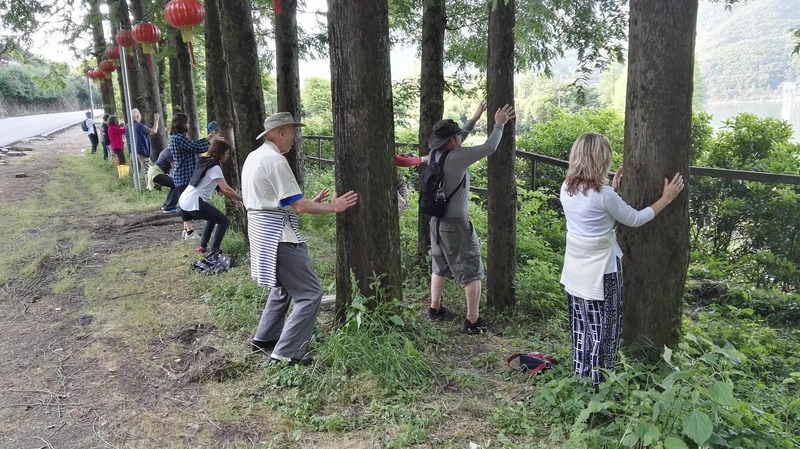 This 2-week TCM wellness tour is designed for those who want to go close to mother-nature, study with the genuine healers and masters, and experience the TCM wellness (yang-sheng) practices in person, while enjoying the breath-taking scenery and traditional culture exploration in China. Experience the closing ceremony with the group of Guolin Xin Qigong Camp; learn some basics of Guolin Qigong from the disciple of master Guolin; tour one of the most beautiful mountains in China, Mount Wuyi; cruise the world most beautiful creek by bamboo raft drifting, watch the unique outdoor show in the open mountain-river theater (Impression Dahongpao), and taste the famous Ganoderma Wellness Medicinal Banquet. 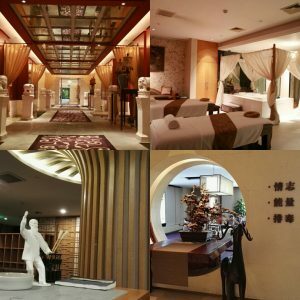 Get the 5-star VIP wellness treatment in the unique yang-sheng place in China – The Ovation Health– Center for Three Healing, while stay in a 5-star hotel. 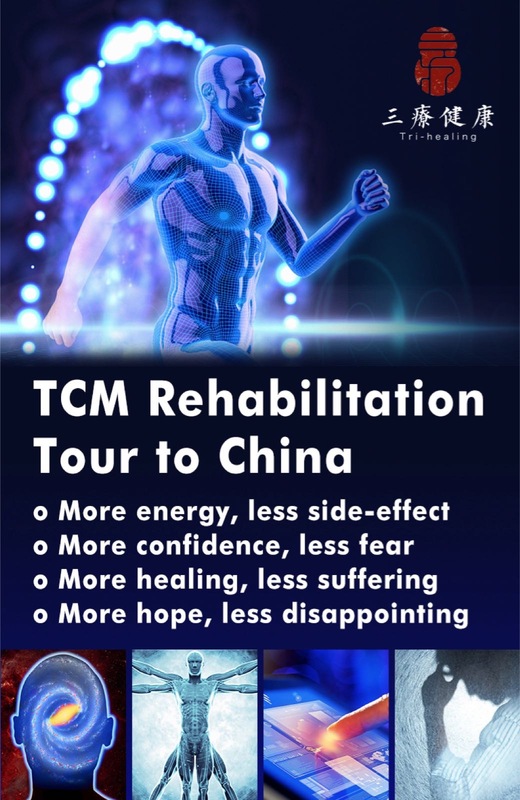 You will get a complete 3-day TCM detoxification treatment after a personal check-up and an examination by the state-of-arts biological micro-magnetic detecting system, plus you will experience many different aspects of Chinese wellness culture, such as cupping, medicinal bath, acupressure, medicinal food, music healing, and calligraphy for health. 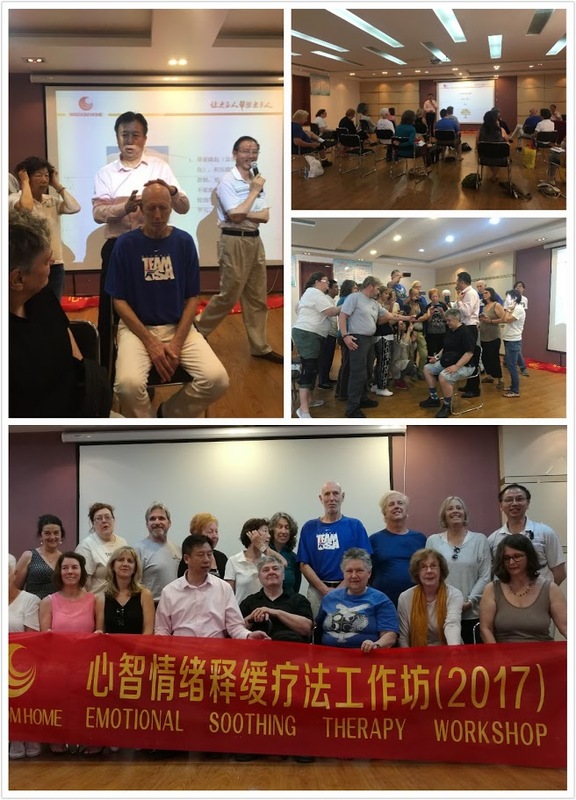 Learning from the best at the special hand-on training of Emotional-Soothing Therapy with Teacher Feng-yuan Bao, and an opportunity to climb up the Great Wall of China…. Here I would like to offer an outline and some itinerary on the main activities, training and sites of this tour, which will help readers to know more details about it, and decide whether this is the right tour for them this time or in the future. 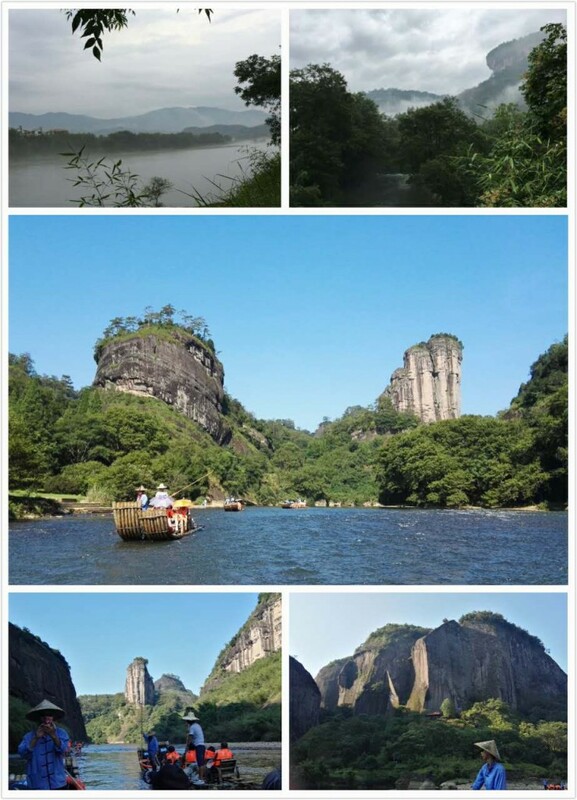 Wuyishan (Mount Wuyi) — the world culture and natural dual heritage, and a national 5A-class tourist attraction, known as “Natural oxygen bar”, “Yang-sheng paradise”, and “China’s immortal city,” where the immortals live… — we are coming here for a special Wellness event and experience of human-universe correspondence…. 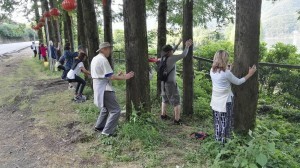 For the first time, the Guolin Disciple Xinqigong Therapy Research Association, led by master Jian Wang, will teach the entire system of Guolin Xin Qigong (GLXQG) in English, at the famous Mount Wuyi, plus other unique lectures and wellness programs, in October 9-19, 2017. 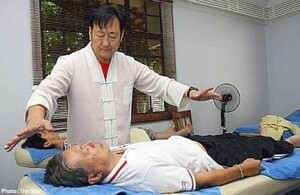 GLXQG is the most popular anti-cancer medical Qigong in China, and the only anti-cancer health Qigong formally recommended and approved by the General Administration of Sports, China. 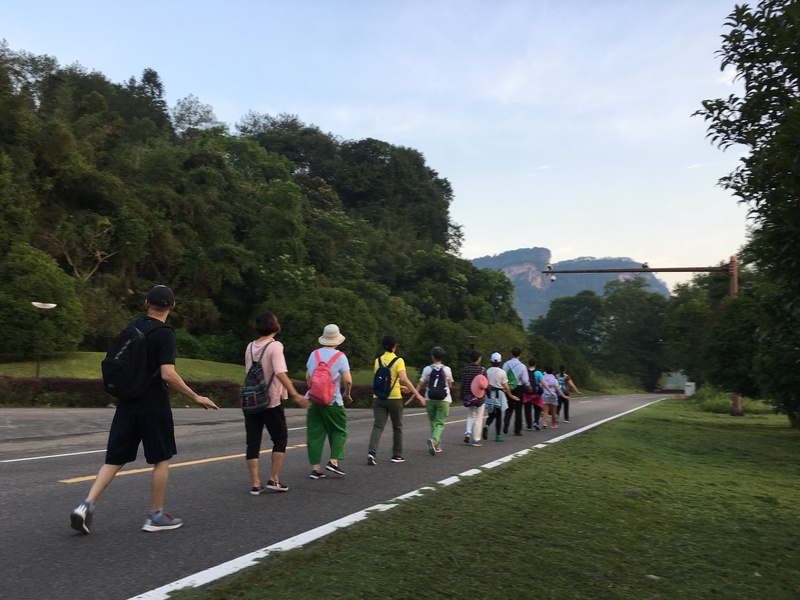 We will join the special Qigong camp on their closing day to learn what GLXQG can do in people’s life, and to enjoy the closing ceremony with some wonderful entertainment and Qigong demonstrations. The second day on Wuyishan will be a whole-day tour to the beautiful scenery at Mount Wuyi, following video will give you some basic ideas on what you may expect from the mountain with world culture and natural dual heritage. This could be the best place to understand the Chinese health-wellness philosophy, or so-called heaven-human correspondence. One of the highlights will be cruising the world most beautiful creek – the Nine-Curve Creek — by the unique bamboo raft drifting, there is simply no word that can fully describe the beauty and sensation you will experience there. Please enjoy a short video below for some of scenery …. In the evening, we will go to the one-of-kind mountain-water open theater to watch the music-dancing show – Impression Dahongpao, directed by Mr. ZHANG Yimo and his team, designed specifically for the Mount Wuyi. The performance has a strong lineup, with stage visual effects reaching as far as 12,000 meters (8 miles length), which offers audience the impression of “people wonder in the middle of painting,” an unique experience. With a high-level of creative planning “Impression Dahongpao” merges the profound meaning of the tea cultural connotation with the beautiful natural landscape, condensed into a high level of art feast, making it truly touchable and sensible culture of tourism. On the third day, we will visit the Ganoderma Health Park, an ecological wellness company that produces many ganoderma health products. 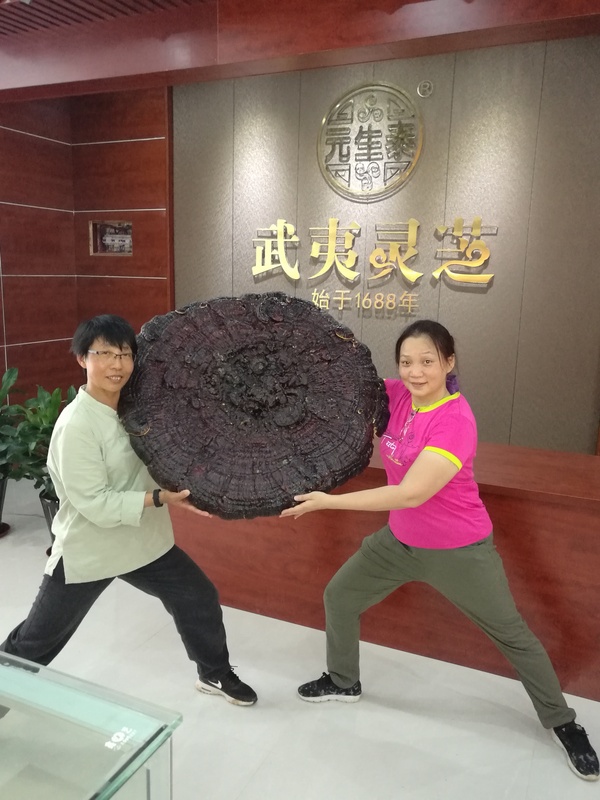 We will visit their farming base, museum of Ganoderma, the production units, and have chance to shop at a huge discount the company offers to the Guolin Qigong group, since Ganoderma has been one of the most popular dietary supplement for cancer patients to boost up immune system. You will get chance to learn every aspect of Ganoderma as a herb or a medicinal food, as well as how to cultivate them. During our stay in Wuyishan, we will have chance to taste the famous Ganoderma Yang-sheng banquet as part of our wellness tour. 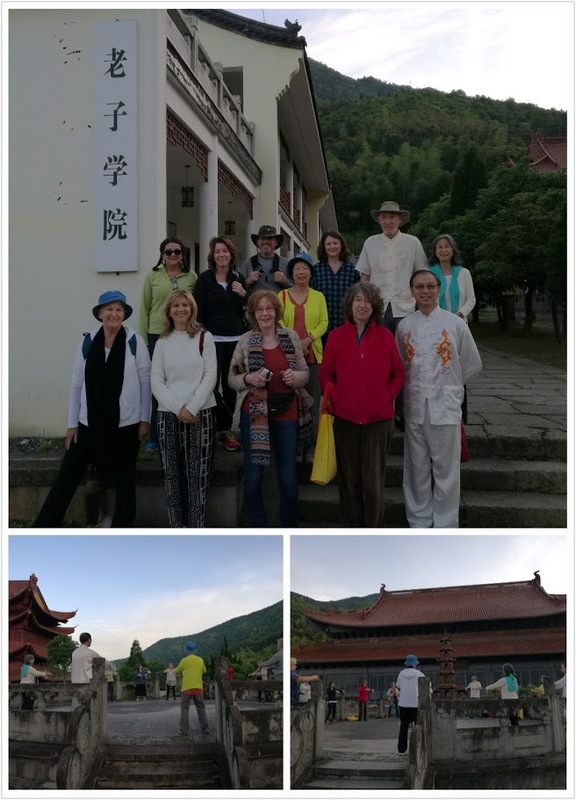 Have you ever dreamed of studying and practicing Daoism yang-sheng skills deeply in a mountain and with the real Daoist priests? Here is your chance to just do that. Mount Jinhua is a famous place for Daoist practitioners with the nickname of the 36th Cave-Heaven of Daoism. Historically, Mount Jinhua has been a Doaist holy-land for elixir refinement and cultivation. It was said that the well-known Yellow Emperor and his teacher Nine-heaven Xuan-nv had both cultivated elixir and meditation there (that would be more than 2500 years ago). 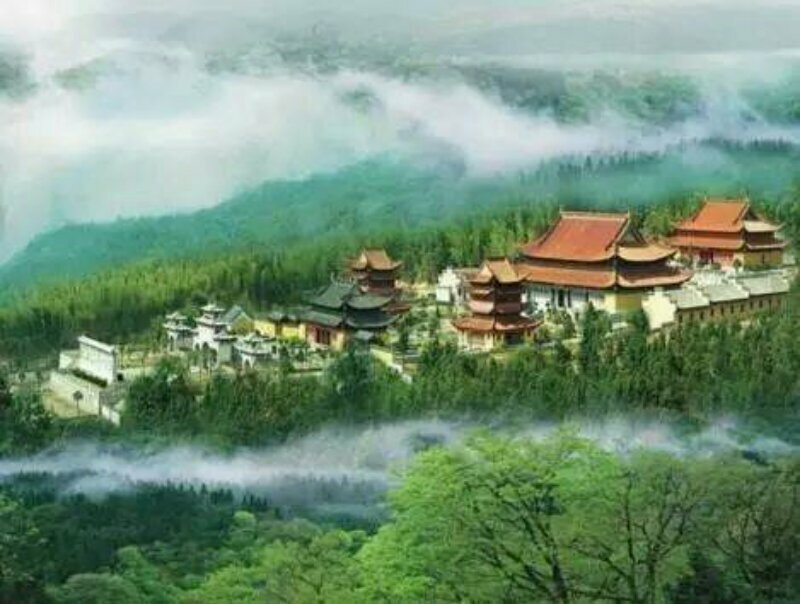 There are actually two Daoist temples in the mountain — the Huang-da-xian Ancestor Temple and the Three-Qing Temple. The rich Daoist practitioners in business donated and built a famous Academy of Lao-zi there to help teaching Daosim culture and practice year around in the Huang-da-xian Ancestor Temple. We will spend three days and nights at the Academy of Lao-zi, and study with the Daoist priests. Click HERE to view some photos of Mount Jinhua on Facebook from our last tour. LangFang – Five-star Experience in Wellness Care, Detoxification and Daily Living. From Jinhua to Langfang, we will experience two completely different wellness cultures — from the gross-root Daoist wisdom of simplicity to the 5-star luxury & modern facility of science and technology. Located in Langfang Development Zone (Hebei province), the Ennova Health Management Group is a secret “black horse” under the ENN group (a large energy company in China). There are three main branches or relatively independent operations in this Health Group: Research Institute of Health, the Center for Three Healings (for wellness & healing), and the Academy of Seven Cultivation with Seven-Cultivation Hotel (to cultivate the virtue & general well-being). The Center for Three Healing focuses on “treating not-yet-occurred diseases” (future illnesses), and its mission is to “let the world have less sickness.,” The center uses the professional health managers as the link, a team of general practitioners of holistic health as leading core, through the means of health monitoring, health assessment, management plans, treatment intervention, continuous service and other methods, the Center provides the intelligent health-management solutions of whole person, whole process, and whole health, meanwhile, export health-operation business model and management model. Integrating traditional Chinese medicine with modern medicine, the Center provides the latest international therapies in detoxification, energy, emotional health (three healings) and other healing products and solutions so as to help customers enjoy the body-mind-spirit comprehensive health! Click HERE to read more about my visit to the Center for Three Healing. 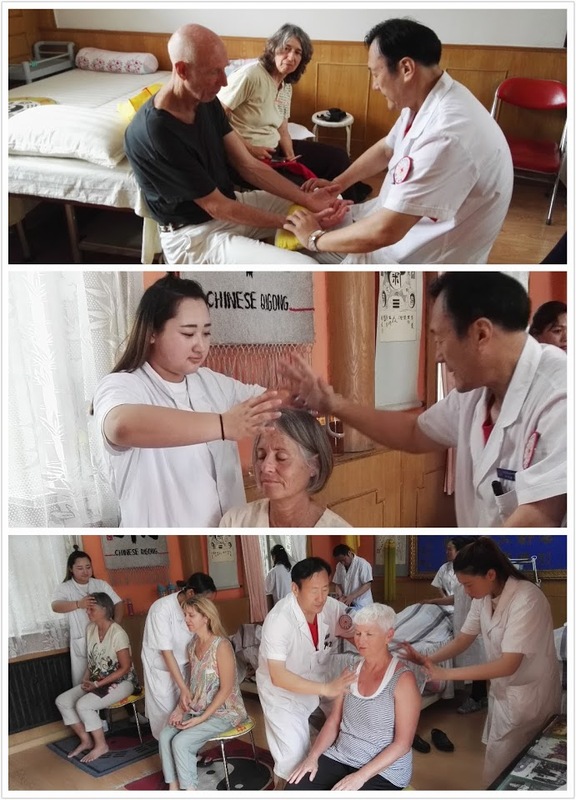 In addition to the health check-up and complete detoxification program, tour participants will also have the opportunity to experience TCM medicinal bath, cupping and therapeutic massage (acupressure). Plus the chance to learn making different medicinal dumplings, and to taste the medicinal foods and the quality 10-serve vegetarian meal. You will feel like a boss or VIP during your stay there. (Click HERE to read more about the services you may get from the Center for Three Healing). 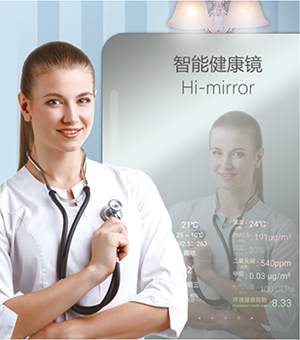 The biological micro-magnetic detecting system is a new technology of noninvasive comprehensive health examination. Through the analysis of small urine samples, it gives detailed results (in hundreds of data points) of the organs, nutrition, environmental toxins, and psychological emotions, as well as the personalized recommendations. According to those who took the test, the results are pretty accurate in general. There are many latest state-of-arts examining and treatment equipment at the Center, such as sleep monitoring, psychological stress testing (mental stress analyzer), relaxation bed (V8 body decompression chamber), body-function detector, quantum medical testing equipment…. you name it! During our stay in LangFang, we will also visit the sister facility-hotel of Ennova Health Group – the Academy of Seven Cultivation and the Seven-Cultivation Hotel. The Seven Cultivations, coming originally from Buddhism Shaolin Temple, refer to the cultivation of virtue, food, flower, music, calligraphy, fragrance, and Gong (Taichi & Qigong). I am writing a separate article to introduce about this unique resort-style hotel and learning academy. For half a day, we may not be able to experience every aspect of seven cultivation, but will definitely get basic ideas on what they are about, and have hand-on experience in music and calligraphic cultivation. Click HERE to view some photos of the Center for Three Healing at Ovation Health on Facebook from my last visit. Click HERE to view some photos of Beijing Traditional Medicine Exchange Center on Facebook from our last tour. The last two days in Beijing will be centered on the training of Emotional Soothing Therapy (EST) by Teacher Fengyuan Bao, who is the founder of Mind-Wisdom Medicine (which has been very famous in China), and has created and applied the EST to help thousands of people in China. Through years of painstaking research and study on the consciousness philosophy and quantum physics, Teacher Bao combines the Eastern philosophical wisdom and Western scientific evidence for the effective integration of Einstein energy and material conversion science theory, based on his own experience and years of clinical practices, he put forward the theoretical points of view regarding the Mind-Wisdom Energy as following: (1) In this world everything we own or experience, including wealth, marriage, health, career, and interpersonal relationships, are all the results of material and energy interaction and exchange. (2) The effect of different energy on the materials can change the properties of that material. While the influence of human mind-wisdom determines the convergence and dispersion of human energy. Human life and fate are the results of our mind-wisdom and energy presentation. (3) Material and energy have interdependence, interaction and mutual transformation of the relationship, so to enhance the mind-wisdom energy is to create tangible materials. (4) The human mind energy comes from the ideological realm, emotional treatment, family relations and genetic four aspects of the role and impact. (5) The mood or emotion is not only the greatest consumption of mind-wisdom energy, but also produce confusion, physical illness, interpersonal disputes, family conflicts and social problems. There are so many tourism attracts in Beijing but we had so little time after all the wellness study and training. We will spend half day to climb the Great Wall, and visit the Olympic Park as well as some driving-by sight-seeing since our main purpose of the tour is on Wellness study, but not on tour itself. 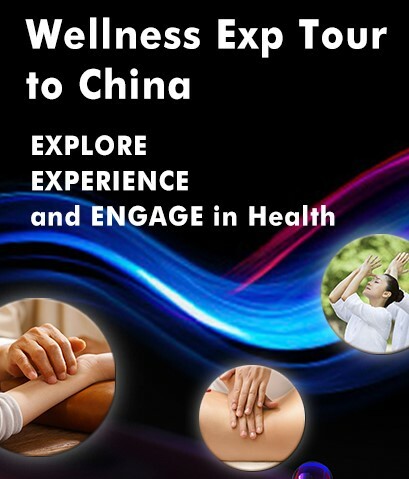 The wellness tour will end in Beijing on November 1, the participants can choose returning to the U.S. after two weeks of tour, or go on an additional 3-day VIP tour in Beijing (with additional cost, itinerary available upon request), which will include the famous tourism spots like forbidden city, heavenly temper, summer palace, national history museum and so on. Int’l flight (D.C. <–> Beijing or Shanghai): $1,100 (or you can book your own flight) — Early registration will save a lot in fight cost. 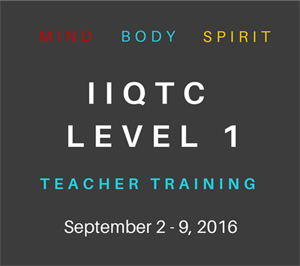 We have limited number of spots open to the public. 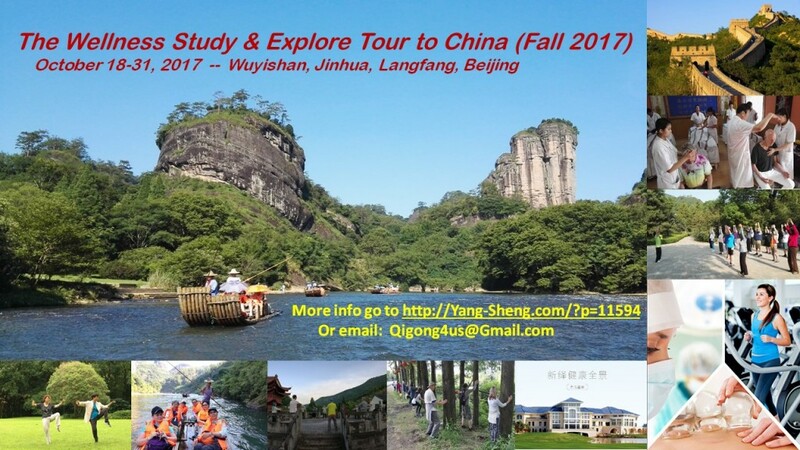 Please click HERE to download the Second Wellness Study Tour Registration_2017; return the signed registration form with payment to register (the tour takes only a total of 30 participants at first-come first-serve, so please register earlier for your spot. International flight: Washing-DC to Beijing around trip: US$1,100 (You can book your own flight to arrive the same day) – It will be most convenient if you book flights from your city to Shanghai, and return from Beijing to your city. Please note, we will start book the flight for registered participant in September as the early we book, the cheaper the fight ticket is. Due to the limitation of training facility, the tour will take only 39 participants in total on the first-come first-serve base. 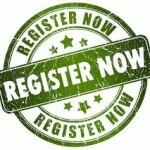 The registration will close by October 1 or when the maximum number is reached. $500 deposit required when registering for participation ($250 non-refundable due to the penalty from canceling reservations), so that the trains and hotels can be reserved in your name. The rest balance is due on September 26, (3 weeks before departure). Our cancellation policy is based on trip director discretion and we do our best to help on a case-by-case basis. As the departure date nears, it will of course be more difficult to provide full refunds due to fees and fares that we pay in advance. You need a valid passport and a China Visa to make it to the tour. If you don’t have a China visa yet, please do so at your early convenience. Once you decide to go, please get your China visa ASAP as China may change its policy on visa application process in response to president Trump tightening policy. 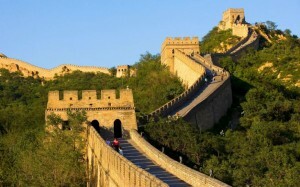 I have reached agreement with a VISA service company in DC for a discount price in full service, please go to web site: http://www.mychinavisa.com for Visa information. After all 30 spots are filled, late registrant will be placed in a waiting list, for possible fill-in later after other’s cancellation, or when situation changes. I am not sure if we are going to offer future tour or not at this moment as my schedule at job may not allow me to do this for a while. Please act with that in mind. Thank you for your interests in this Tour! 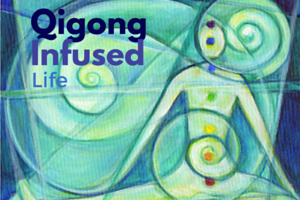 This entry was posted in Healing through Pleasure, Qigong, Wellness Tour. Bookmark the permalink. Is there a possibility that you do this trip in 2018?